2Department of Microbiology & Tropical Medicine, The George Washington University, Ross Hall, 2300 Eye Street NW, Washington DC 20037, USA. Anatomical and molecular character evolution in the Basommatophora: conflict or congruence? The Basommatophora represent a large group of predominantly limnic gastropods. They comprise about 15 families with several hundred assigned species. Many of them are of considerable importance for freshwater ecology and human health. Yet, systematics, phylogenetic relationships and character evolution are controversially discussed and poorly understood. In order to compare the performance of anatomical and molecular datasets and to study the degree of their congruence, we analyzed 80 soft body and shell traits as well as sequences of the COI mtDNA and 18S rRNA genes from the type species of 32 basommatophoran genera involving 10 families. Whereas the two genetic markers yielded rather well resolved and congruent phylogenies, a cladistic analysis of the anatomical data resulted in an unresolved polytomy. A comparison of phylogenetic signals showed a significant signal in the molecular dataset. However, the phylogenetic signal in the anatomical dataset was not significant, possibly indicating a high degree of homoplasy and ‘background noise’. We then mapped the anatomical character-states on to the molecular phylogeny, which was generated fromthe combined COI+18S dataset. The results show that many characters “evolved” independently, supporting the hypothesis of extensive homoplasies in the anatomical dataset. In order to find those anatomical characters that statistically discriminate among higher basommatophoran taxa, we performed discriminant analyses (DA) with DNA lineages as a grouping variable. Only few anatomical characters were retained in the DA. These characters and the problem of homoplasy are discussed in the context of basommatophoran evolution. Ideally specimens for electron microscopy (EM) should be fixed whilst still alive, the specimens should then be processed as rapidly as possible, a process usually requiring full laboratory facilities including access to chemicals, refrigerators, balances and fume cabinets. This is not always possible during extended collection trips or when collecting in remote areas. However, with some forward planning, it is possible to collect and fix materials for EM with no laboratory facilities at all. Careful planning is the key to successful collecting and with a little forethought you can minimise the reagents you need to take with you and assemble the materials required when you arrive. Minimal amounts of fixatives can be taken as pre-measured aliquots. Buffers can be taken as pre-weighed powders which only require reconstitution with distilled or de-ionised water. Samples can be successfully cleaned, relaxed and fixed with the bare minimum of facilities. Many of the supposed “rules” of EM preparation are designed to minimise preparation time rather than to optimise the results. For relatively small samples, representative examples of different tissues or even whole dissections can be fixed entire and maintained in fixative for extended periods whilst still yielding excellent results. A variety of basic advice (including how to work safely) will be presented, together with protocols useful for relaxing, fixing, decalcifying and cleaning specimens. In addition some examples of best practice for mounting and preparing samples for SEM and TEM will be discussed. 9, The Mallows, Maidstone, Kent ME14 2PX, UK. The modern grid-square distributional survey of British land and freshwater Mollusca was launched by the Conchological Society in 1961, an interim atlas being published in 1976, followed by a revised version in 1999. Despite the enthusiasm reflected in the surveys, long-established taxonomic changes introduced by continental aythorities have largely been ignored by British malacologists. The taxon formerly regarded as Lymnaea palustris (Muller, 1774) has been shown to include a second, anatomically well-defined species Stagnicola fuscus ((C.Pfeffer, 1821). On the basis of available information, this second species would appear to be the commoner of the two. H-6722 Szeged Egyetem u. 2-6. The prodelta, delta slope deposits of the Szák Claymarl Formation from the Miocene Lake Pannon are exposed in the pits of the Tata brickyard. The deposits of the brickyard are composed of silty clay, claymarl with very thin sand and at some horizons intercalations of highly limonitic coquinas with the broken shells of a typical shallow water fauna. The deposits are highly fossiliferous with a dominance of malacofauna. According to the latest stratigraphic classifications they belong to the Congeria cžjžeki–Congeria zagrabiensis biozone. The absolute age of the deposits is around 9.5 MA. There is a dominance of bivalves in the fauna with Congerias being the most frequent species [Congeria cžjžeki M. Hörnes, Congeria partschi Cžjžek and in the coquinas of storm deposits Congeria ungulacaprae (Münster)]. The second richest group is that of Limnocardiids which will possibly yield a lot of new endemic species in the future. Furthermore endemic deep-water Pulmonates are also present with the dominance of Planorbids, Radix and its descendants the endemic flat, plate-like Valenciennius. Our work is supported by OTKA Grant T029342. Cold seeps are fascinating and unusual environments. They are populated by distinctive communities of animals, many of which derive their nutrition from chemosynthetic endosymbiotic bacteria. Cold seep communities, both modern and ancient, are found in a range of geological settings, on both active and passive plate margins. However, the biogeographic distribution of modern cold seep fauna is presently poorly understood. This project seeks to explain the distribution of modern seep animals by examining a series of Tertiary cold seep sites in the Caribbean region. This area is particularly significant because, prior to the raising of the Isthmus of Panama (3Ma ago), the Caribbean Sea provided a direct, open water link between the Atlantic and Pacific Oceans. National Museum of Wales, Cathays Park, Cardiff CF10 3NP, UK. The freshwater pearl mussel (Margaritifera margaritifera) is an endangered species in Britain and is threatened throughout most of its European range. The family is markedly conservative throughout its long evolutionary history (Cretaceous & Recent) with no more than 6 extant species recognised. Given the rapid decline in population size, conservation measures could include translocation of individuals as re-introduction; although in those cases where this has been attempted there has been little success. Therefore, there is a need to understand the genetic separation of populations before further experiments are undertaken. A pilot study involved three Irish, three Welsh and three northern English populations. Two of the Irish populations showed good separation. The results showed long tree lengths (large amount of variation) for the Irish populations and short branched for the northern England and the Welsh populations. It has been hypothesised that the genetic separation may be due to population longevity related to Pleistocene extinctions – both Irish populations inhabit rivers not affected by the last glacial maximum. The pilot project has been expanded to encompass the north-east of England, south Wales, France, Czech Republic and Austria. Using RAPDs (Random Amplified Polymorphic DNA) allows comparison within and between populations and has previously been proven as a positive methodology to show intraspecific variation. In addition, this report aims to provide further information as to the re-population of those rivers covered by ice in the last glacial period . Were they re-populated via the east of England from Europe or from the glacial refuges in the west and over Scotland? School of Biology and Biochemistry, Queen’s University, Belfast BT9 7BL. Strangford Lough historically had a productive Ostrea edulis fishery supporting up to 20 boats in oyster dredging although by 1903 oyster fishing in the Lough had effectively ceased 1. •Laying clutch and seed and re-laying native adults. •Estimating oyster and cultch densities monitoring oyster larval densities and spatfall in summer and autumn. •Investigations into native beds revealed natural cultch cover between 0 and 70% and low densities of oysters (1-2 1000m-2). •In contrast, densities of O. edulis on commercial mats ranged between 66 and 100 individuals m-2. •Larval densities peaked in August and September and were highest in outflows close to commercial stock embayments. Output: as a result of the 1997-99 project fishermen have started to take the first harvest of native oysters from Strangford Lough for nearly 100 years. Proposed research. The current project will undertake: •benthic and intertidal surveys to ascertain the current state of O. edulis stocks. •Plankton surveys August 2003 for comparison with 1998 data. • Investigation into predatory impact on developing spat. • Comparison of the biodiversity of established undisturbed beds and fished beds. 1 Kennedy, R.J., and Roberts, D. 1999 A survey of the current status of the Flat Oyster Ostrea edulis in Strangford Lough. Biology and Environment: Proceedings of The Royal Irish Academy, 99B, 79-88. Institut Méditerranéen d’Ecologie et de Paléoécologie, Equipe Ecologie du Paysage, Case 461, Faculté des Sciences et Techniques de St Jérôme, 13397 Marseille CEDEX 20, France. Fire is a major disturbance within Mediterranean ecosystems in Southern France and has drastic consequences for the less mobile fauna. Numerous papers deal with the impact of fire on the Mediterranean fauna, but no study has ever been performed on land snails, although they are good indicators of this impact. Land snails live, for the most part, on vegetation or in litter; their ability to escape is minimal, and they are very sensitive to desiccation. Thus, snails are directly exposed to fire, and also to the destruction of their microhabitats. Moreover, their capacity for active dispersal is generally low. The aims of the present study were (1) to define the short-, middle- and long-term impact of fire on the species richness and diversity of land snail communities, (2) to clarify the consequences of successive fires at relatively short intervals (less than 25 years) on malacofaunas, and (3) to reveal the pattern of post-fire recolonisation within these communities. Despite a drastic reduction in abundance in the first years after a fire, Mediterranean land snail communities seemed to show a high resilience to fire, provided the interval between successive fires exceeds ten years. Patterns of post-fire recolonisation were not really clear; post-fire snail communities seemed to depend on the structure of pre- and post-fire habitats, and also on numerous and scattered refuges provided by varying fire intensities within a site. Museum of Natural History, Wroc?aw University, Sienkiewicza 21, 50-335 Wroc?aw, Poland. The life cycle of Helicodonta obvoluta, a Central European species with its northern distribution border in Poland, was studied in the field and in the laboratory. The spring reproductive period from the beginning of April through May and June, the autumn period lasts from mid-August till October. Eggs (13-27 per clutch) are laid in crevices in rotting wood; one to two clutches are produced yearly, the maximum per lifetime being six clutches. The eggs are laid in clusters, spherical or slightly elongate (length/width ratio 1.0-.121), of major diameter 2.1-2.85 mm, calcified. The incubation period is 14-21 days, hatching being asynchronous. The hatchlings consume the remnants of the eggshell; egg cannibalism has been observed. The final shell size (5.75-6.6 whorls, aperture surrounded by lip) is reached in about 10 months, when the snails reach sexual maturity. The mean shell increment is 0.4 whorls per month. The maximum life span in the laboratory is 3 years, and in the wild the average is 2 years. Museum of Natural History, Wroc?aw University, Sienkiewicza 21, 50-335 Wroclaw, Poland. Freshwater mussels have a complicated life cycle, including a short parasitic phase on a host fish. The recent decline of many species has created interest in rearing some species artificially. In this talk I will present my attempts to rear native British unionids under laboratory conditions. So far 3 species have been reared for a number of months. Anodonta spp. reached lengths of over 1cm in 6 months. The techniques used have been small-scale and use simple inexpensive apparatus. I hope to eventually try these techniques on some of the more endangered European species of freshwater mussels. During the last five years, the invasive Asian clam Corbicula fluminea has spread rapidly through one of Britain’s most important wetland areas, the Norfolk Broads National Park. Using C. fluminea as its main example, this talk will illustrate some of the complex issues surrounding the invasion of aquatic ecosystems by alien species. Over the last two years, research has been carried out into the origin, spread, autecology and impacts of this prolific freshwater pest. In particular, I will present studies of the potential impact of the clam on native bivalves, wildfowl and river sediment composition. Intracellular signalling in hemocytes from the freshwater gastropod, Lymnaea stagnalis. Freshwater snails are intermediate hosts for a range of helminth parasites including important species of Schistosoma and Fasciola. To understand how the snail responds to parasite infection, the molluscan immune system needs to be explored. Hemocytes, the major immune cells of snails, functionally resemble mammalian macrophages and are responsible for the phagocytosis of invading organisms, such as parasites. In macrophages, it is known that activation of the highly conserved Mitogen-Activated Protein Kinase (MAPK) pathway by infection results in actin re-modelling, altered gene expression and phagocytosis. However, the molecular mechanisms leading to phagocytosis in molluscan hemocytes have not yet been elucidated. We have identified two MAPK homologues (ERK 1/2) in hemocytes from the freshwater snail L. stagnalis. As a model to study the molecular mechanisms of phagocytosis in L. stagnalis hemocytes, we have challenged these cells with lipopolysaccharide (LPS) from E. coli, which resulted in activation of the ERK 1/2 pathway. Rugosity is a noun based on the adjective rugose, meaning wrinkled. In an ecological context, this is related to the structure of landscape/substratum. Scale is of paramount importance to both an organism and substratum under study, thus affecting all further considerations. In a freshwater environment rugosity can and must be related to other ecological aspects such as, the Reynolds number, and energy use, the Froude number and Manning’s ‘n’. These aspects are of great importance to aquatic organisms which are affected by hydraulic phenomena. For aquatic snails, this is especially important, as they are often found upon aquatic plants which support the food supply of the snails as well as offering offer a place of relatively safety for egg deposition .Several different rugosities are being tested in the laboratory, to see whether snails have a preference for any particular type of surface. c/o Department of Zoology, The Natural History Museum, London SW7 5BD, UK. Sri Lanka has a rich land-snail fauna, which has been neglected since pioneering work done during the British Colonial Period. a key objective of a recently completed three year Darwin Initiative Project on Sri Lankan land-snail diversity has been to develop a basic understanding of the distribution and conservation status of the snail fauna. Surveys of Sri Lanka’s three major climatic zones, the so-called dry, wet and intermediate zones were carried out. Preliminary findings show that the wet zone harbours a substantial share of the island’s land-snail diversity and endemism, with many wet zone species having highly localised distributions. Our data also strongly support the view that there are two distinct land-snail communities in the lowland and montane regions of the wet zone. Geographic variation of the land snail Granaria frumentum (Draparnaud, 1801) in central and southeast Europe. Granaria frumentum (Drap. 1801) is a widely distributed and mostly xerophilous land snail species. The status of the subspecies illyrica was critically investigated by us. We used 15-30 specimen samples of the species collected at each locality from various sites of South and Central Europe. We measured and counted several morphological variables and characters on the shells, like height of shell, width of shell, height of aperture, width of aperture, height of the ultimate and the penultimate whorl, presence/absence of apertural folds, marginal flange and cervical thickening at the aperture of the shells. We performed statistical analyses for evaluating our data. Our results show the separation of the Central European, the Dinaric and the Central Balkanian forms on the basis of the measured morphological variables. The pattern is different concerning the shell characters, the subspecies illyrica is confined to a narrow zone along the Adriatic Sea. Museum of Zoology, Cambridge University, Downing Street, Cambridge,CB2 3EJ, UK. In Britain, land snail analysis of Holocene (last 10,000 years) deposits has revealed detailed successions often tied to secure radiocarbon-dated chronologies. These have provided information on community development and local environmental change, including episodes of prehistoric human activity, from the end of the last glacial period. In comparison, records of Holocene land snail successions from Ireland are sparse. Consequently there is little understanding of Irish historical biogeography. This project aims to increase the number and knowledge of well-dated Holocene molluscan successions from Ireland. Two recently discovered extensive tufa sites in west Ireland offer the potential of obtaining detailed fossil mollusc records with a high temporal resolution. Profiles from various locations across both tufas have been sampled. The deposits are extremely rich in land snails and contain numerous horizons with abundant charcoal and burnt stones. This allows the exciting possibility of directly linking snail faunas with known episodes of human activity. Analysis of veliger anatomy is important in understanding their adaptation to the planktonic environment. 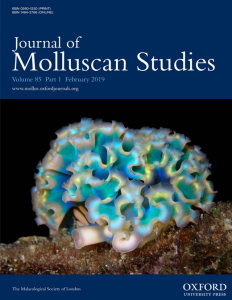 Scanning and Transmission Electron Microscopy has been used to examine the cilature of the mantle and velum of both Crassostrea gigas and Ostrea edulis. Differences were observed in the cilia patterning of the velum between the two, with O.edulis featuring an additional row of compound cilia beneath the pre-oral compound cilia. Both of these species have a distinct arrangement of cilia on the inner fold of the mantle, with three types of groupings of cilia identified. The histology and cytology of the mantle and velum cells is under investigation. Differences could relate to differences in early life history: O.edulis is a short-term brooder, while C. gigas is a broadcast spawner. Freshwater limpets of the nominal species Ancylus fluviatilis (O:F: MÜLLER, 1774) are found across the western Palaeartic and North Africa. Data on mitochondrial(16S rDNA an COI) and nuclear (ITS1) gene regions revealed that Ancylus fluviatilis is composed of at least four highly divergent lineages. Three clades are widespread, while the fourth is known from only a single population. The aim of our study is to correlate genetic informations with shell morphology and different ecological parameters. Therefore, we collected over 50 populations over the species range. Individuals were related with RFLP analysis to one of the three main lineages. Morphological analyses of the shells were performed with Fourier analysis. Correlation analyses between different ecological parameters like temperatures, precipitation and altitude and the lineage distributions were carried out. The aperture deflection is a common feature in Helicid land snails. This called the attention of various authors to explain its functional significance. These are (1) the adaptation to reduce water loss from resting individuals, since tangential aperture makes close seal against surface, which benefit can explains the deflection in growth of mature snails. (2) Adaptation to lower centre of gravity to reduce the probability of dislodgement during inactivity. Because of the great weight of the shell and enclosed visceral mass, the shell balance is certainly a particular problem for terrestrial snails. Our results show that there is a negative interspecific correlation between spire index and the angle of aperture deflection relative to the coiling axis. This result underlines both hypotheses mentioned above. The analysis of the intraspecific variation is in progress. 1National Museum and Galleries of Wales, Cathays Park, Cardiff CF10 3NP, Wales. 2National Museum of Scotland, Chambers Street, Edinburgh EH1 1JF, Scotland. Amongst the most important parts of collections are the type specimens they hold. Types are essential to taxonomists as they are specimens used to fix scientific names, using Latin as a universal language. Over the years the rules that regulate the naming of animals have become stricter, but it is important to understand, when interpreting historical material, that this was not the case in previous times. For example, holotypes were not always designated but a series of shells, known as syntypes were used. This is not an accepted procedure today, a holotype must be designated. Type material in historical collections is not necessarily obvious from its labelling, or it can appear to be obvious but is misleading. Often there can be confusion when old terms such as ‘Cotype’ are used and it may need days of research to assess whether a specimen really is a ‘type’, or not. This poster shows a case study of a specimen of Melania tsushimana Fulton, 1914 labelled ‘Cotype’, from the National Museum of Scotland, and how we researched the validity of its type status.